(M-55): 5"x10' Boom 4/bag, Oil Only Open-Net Boom; 4/bag (ABSORBS UP TO 24 GALLONS/91 LITERS PER BAG). Each for $117.50. (M-50): 8"x10' Boom 4/bag, Oil Only Open-Net Boom; 4/bag (ABSORBS UP TO 48 GALLONS/182 LITERS PER BAG). Each for $182.10. (M-40): 8"x20' Boom 2/bag,Oil Only Open-Net Boom; 2/bag (ABSORBS UP TO 48 GALLONS/182 LITERS PER BAG). Each for $197.20. •Premium sorbent for extended-use/high durability. •Absorbs any oil or hydrocarbon while repelling water. •Available in various sizes for a customized fit. •Contained in a white fish netting sleeve which enables greater oil penetration and easy saturation indication. •Strategically placed hooks to form a boom chain of any length. •Forms a floating migration barrier to contain and absorb oil spills on water. 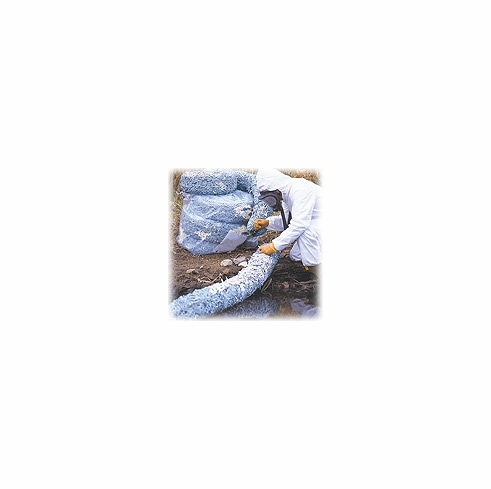 •Can be used as a barrier in holding ponds to retain waste and debris. •Continues to float while fully saturated. •Contained absorbent makes cleanup quick and easy.